Geocaching in Texas State Parks! Geocaching is a modern-day treasure hunt! People hide geocaches everywhere—from just down the street to the most remote wilderness areas. Many are hidden in your state parks. Read on to learn more about geocaching! Geocaching is the hunt for any of more than 2 million geocaches worldwide hidden by folks like you. Each treasure hunt will take you to a fun, creative or beautiful place outdoors. Geo means earth and cache means hidden item. Geocaches range from very small (like a film canister) to large (such as a metal lunch box). Many are camouflaged, but they are not buried. Geocaches hold things like a log book to sign your name, tradable items for kids and adults, and more. Use a GPS unit or smartphone app to find the coordinates (the exact location) of a geocache nearby. Then set out on your adventure, enjoying the sights along the way! Visit Geocaching.com, or use a smartphone app to find caches where you are. 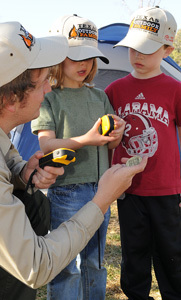 Choose an easy cache for your first hunt. Caches have ratings on difficulty, size and terrain. Download the coordinates to your GPS or use your smartphone, and head out to look for your treasure. It might take a few minutes to find the cache once you reach the destination! Approach the cache safely. Some of the best hiding spots can also be homes for wildlife. Open the container, sign the log, and trade a family-friendly item with something in the cache. Replace the container exactly as you found it. This keeps the game fun for the next geocacher. Log your find on Geocaching.com and tell the world about your adventure! Collect a "smiley" face symbol for each geocache find you report. Inexpensive small items to trade for cache "swag"
Terrain: Each geocache has a terrain rating of one to five stars. One star means the geocache is accessible by wheelchair. Five stars means you will need special equipment (boat, 4WD, etc.) to find the cache. Difficulty: Each geocache also has a difficulty rating of one to five stars, based on how hard it is to find. One star means the cache can be found quickly. Five stars means the cache is hard to find or open. FTF: First to Find, or the first person to find a new geocache. TFTC: Thanks for the cache, or a thanks to the original hider of the cache. Ground Zero or GZ: A cache’s location. TNLN: Took Nothing Left Nothing, meaning that the finder did not trade any swag. Muggles: Someone who is not geocaching. Avoid muggles while geocaching, so that they won’t vandalize or “muggle” the caches. Geocoin, Travelbug or Pathtag: These items have identification numbers. They can be shared with friends and tracked as they are carried from one cache to the next. Be sure to Leave No Trace of your visit! Stay on trails for as long as you can. Leave what you find, including flowers, rocks and artifacts. Consider others. Don't park in campsites; keep voices low. Take your trash. Help keep our spaces beautiful. Respect wildlife; you are in their backyard! Look for online resources like message boards, community geocache associations and Facebook groups. Visit the Learn section on Geocaching.com. Find a Geocaching 101 workshop in your area on our Events page. 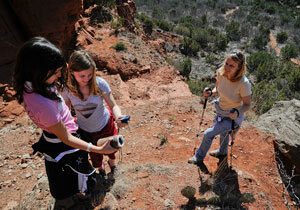 Download guidelines for hiding a geocache on a TPWD property. Sign up for e-mail updates about geocaching.com.